All of our cottages are fully equipped with a stove, microwave, coffee maker, toaster, refrigerator, cooking utensils, dishes. All are heated and have private bathrooms with showers. Please bring your own sheets (including fitted, flat and pillow cases), towels (shower and beach), soap, toilet paper, garbage bags, personal toiletries, kitchen towels and dish cloths. 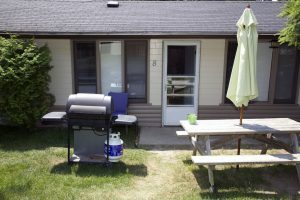 All cottages come equipped with a BBQ and propane is provided. Smoking is not permitted inside our cottages. During prime season the cottages rent by the week only, Saturday to Saturday. 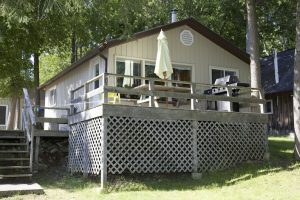 Loon Haven (Formerly Unit #2) is a lakefront cottage with 2 bedrooms, each with a double bed, full kitchen, living room area with a pull out couch and a 3 piece bath. 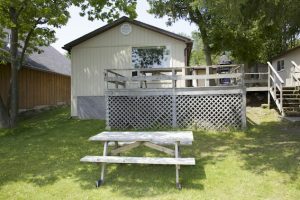 This cottage has a lovely deck overlooking the lake. Single family cottage. 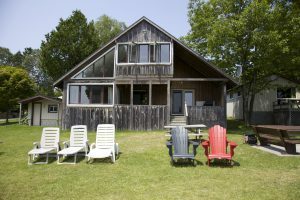 Angler’s Destiny (Formerly Unit #3) is lakefront cottage with 2 bedrooms – one with a double bed, the other with a single over double bunk bed, a full kitchen, living room area with a pull out couch and a 3 piece bath. This cottage has a lovely deck overlooking the lake. Single family cottage. 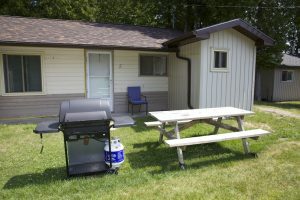 Pickerel’s Perch (Formerly Unit #5) is a 2 bedroom semi-detached unit which offers a view of the lake. It has two bedrooms, each with a double bed, 3 piece bath, full kitchen, dining/living room area with pull out couch. This unit has it own BBQ and picnic table. Single family cottage. Beaver Lodge (Formerly Unit #6) is one of our 2 bedroom semi-detached units, each with a double bed. It has a 3 piece bath, full kitchen, dining/living room area with pull out couch. This unit has its own BBQ and picnic table. Single family cottage. 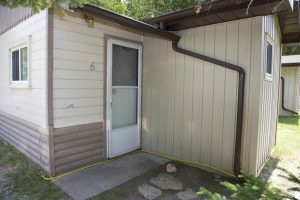 Deep Woods (Formerly Unit # 8) is a 2 bedroom semi-detached unit. One bedroom offers a Queen size bed, the other room a set of bunk beds. This unit has a full kitchen, living room area with a pull out couch, and a 3 piece bath. Single family cottage.